Dive into the world of wild wolves and live your life as one of them! 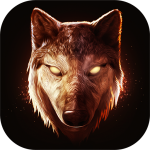 Explore the amazing environment, develop your character and upgrade your skills to become the Alpha of your pack! You can try your strength in one of two modes: CO-OP or PVP – everything in Online Real-Time Multiplayer. The most beautiful and realistic Cat Simulator available on mobile devices! Play as a real cat, explore huge houses and awesome gardens. Choose different cats and dress them as you like and of course, annoy the humans! First person shooter where you can control time. Defeat your enemies and use time to your advantage. Use multiple weapons, explore huge levels and master your skills to complete deadly missions! Play as a real dog, explore huge houses and awesome gardens. Choose different dogs and dress them as you like! Play with interactive people and do whatever you want as a cute doggy. Swift Apps Sp z o.o. © 2016 Swift Apps Sp z o.o. All rights reserved.